The blue "Buy" option below the Order/Ship This Book tab will take you to Bandcamp where you can download the entire "Come As U R!" Study guide as a pdf file immediately. It is no longer an option to purchase downloads of individual study sessions one at a time. But the entire book as a digital download is a great deal at $12.00! It includes discussion guides for each song, and "active learning exercises" to engage students in ways of working with the themes that are fun and participatory. 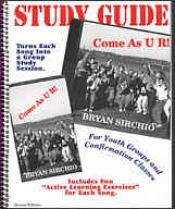 Note: This album and study guide was initially put together to be used as a Confirmation Class resource and includes a great historical overview of the rite of Confirmation put together by Rev. Peter Monkres, the primary author of the guide.